119 results found for: genres:"Contracts"
Baltimore (Md.) 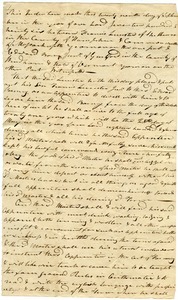 - Documenting the legal transfer of Lot. No. 73, the site of the Du Bois' new Baltimore residence. 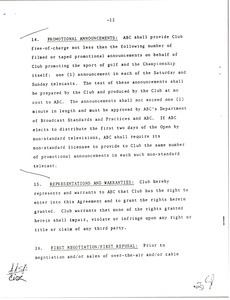 Clause relating to promotional announcements, taken from contract between ABC and and the All England Club. New York (N.Y.) - Stipulating the terms of the agreement between the New York Amsterdam News and the Newspaper Guild of New York. 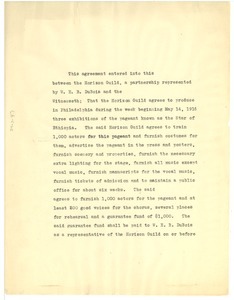 Unsigned agreement outlining the terms of the Horizon Guild's management of the Philadelphia production of "Star of Ethiopia"; noting its according financial obligations; and specifying other requirements for both parties involved. New York (N. Y.) 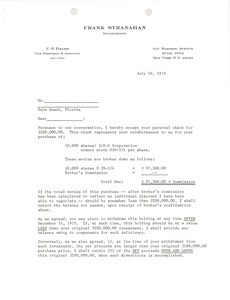 - Contract guarantee against loss in stock investment. 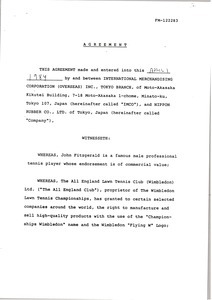 Contract between tennis player John Fitzgerald and Nippon Rubber. Shelburne (Mass.) - Terms and limitations attached to apprenticing Lester to learn agriculture under Barney until age of 21. 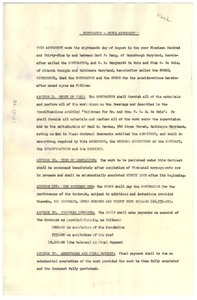 Memorandum of agreement between Dr. W. E. B. 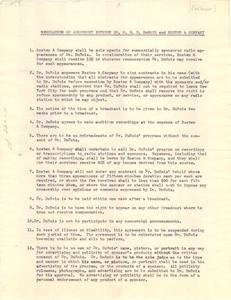 Du Bois and Rosten & Co.
New York (N.Y.) - Final iteration of the terms and conditions for the Company's handling of W. E. B. 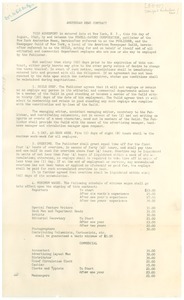 Du Bois's commercially sponsored radio agreements (see mums312-b115-i356 for the Company's original iteration, mums312-b115-i359 for notes on its redaction, and mums312-b115-i347 for an intermediate version). Rapseburg (Md.) 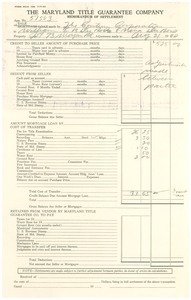 - Formalizing arrangements surrounding the construction of the Du Bois' new home in Baltimore, specifying the scope of work, time frame, and payment scheme; signed by W. E. B. and Nina Du Bois, henceforth "Owners," and Carl F. Haug, "hereinafter called the contractor." Westhampton (Mass.) 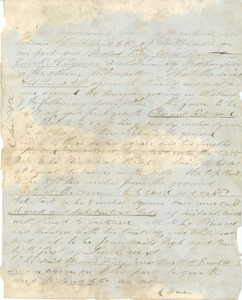 - Contract and specifications for constructing fence around cemetery.